PrazAs Learning Inc, the company behind Tabtor, an educational technology platform for tablet computers (currently only iPads), has raised $1 million in seed round funding from New Jersey-based SoundBoard Angel Fund, as well as Bangalore-based Aarin Capital Partners, Sand Hill Angels, BITS Spark Angels, among other individual investors. SoundBoard Angel Fund led the round. The money will be used for product development and expansion as well as to accelerate market entry into the consumer space. "This capital provides us with the resources that will drive our expansion and place us solidly in the educational technology market â€“ a market that is just beginning to take off. Greater emphasis will be made on making the platform scalable and accessible to multiple partners and across multiple devices, and reaching out to more students globally," said Raj Valli, founder and CEO, Tabtor. The New Jersey (the US) and Chennai-based company was founded by Valli. Before launching PrazAs, he was serving as VP, marketing and head of business development for WABCO Holdings Inc. He holds an MS degree from IIT Madras and an MBA from the University of Maryland (the US). The patent pending Tabtor platform provides teachers and students with a personalised learning experience, which focuses on the point of learning for each student. It is a digital offering that combines personalised teaching with an engaging learning programme that supports multiple subjects. It is tailored to every student using a combination of patent-pending 'real-paper' technology that allows sharing and review of handwritten work, automatic grading, video tutorials and adaptive analytics. 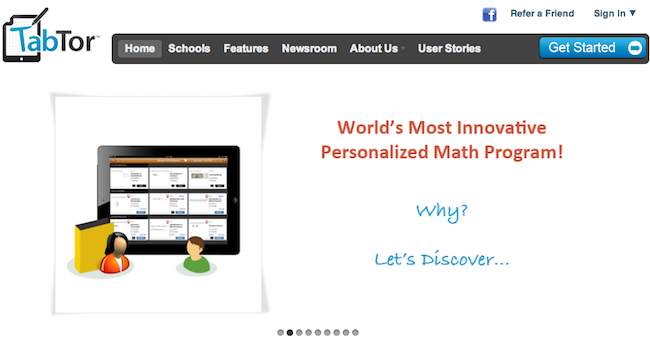 Started with the subject of mathematics, Tabtor is gaining customers in private schools in the US and India, as well as creating a version available for tablets, offering students and families tutoring opportunities from home. While Tabtor is currently only available on iPads, it will soon be offered on Windows 8 and Android tablets as well. Ranjan Pai, managing partner, Aarin Capital Partners, said, "Tabtor uses a unique tablet-based delivery platform that is revolutionising the way students approach and solve problems. We believe that this will be one of the prevailing learning solutions in the future." "Tabtor supplements the bricks and mortar education system by allowing parents and part-time tutor-coaches to accelerate student learning, a great need that is unaddressed in the market," added Satish Gupta, BITS Spark Angels. Earlier this year, the company partnered with Kadokawa Shoten, a Japanese publishing company based in Tokyo that produces magazines, video games and movies. As part of the partnership, the team will bring gamification to tablet-based learning, offering a combined learning and gaming experience to K-12 students in India.